With the end of the 2017 NFL betting season in sight, USA sportsbooks and players alike know they have to make the best of the little time left. Up next is Week 16’s lineup that is filled to the brim with playoff opportunities. One team vying to lock up a spot in this year’s postseason is the San Diego Chargers, who have their eye on either a Wild Card berth or quite possibly an AFC West title. The Chargers will be going up against the New York Jets this weekend. Let’s take a look at what kind of odds gambling websites are giving them against the lowly Jets. The Chargers bolt into this AFC pairing flashing a 7-7 record that ranks them 2nd in the AFC West. At the present moment, the 8-6 Kansas City Chiefs lead the division. But with things being so close, the Chargers could very well win the West. Granted, since Los Angeles lost two games against Kansas City this year, they’ll need the Chiefs to go 0-2 in their last two games. That seems unlikely, but it’s certainly not impossible given the struggles Kansas City has endured all season long. Either way, the Chargers can remain in contention for a Wild Card berth with a win over the Jets this weekend. And by the looks of it, US sportsbook betting sites are siding with Los Angeles over New York. 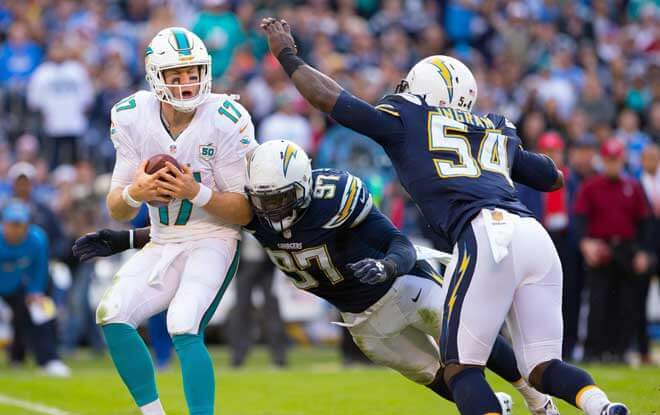 Considering how heavily the money line is favoring Charges this Sunday, bettors are going to want to refrain from taking the Chargers straight up. However, since New York has an 8-5-1 record against the spread this season, taking the Jets to cover that 7-point spread prediction doesn’t seem like a bad idea. Granted, the spread is set kind of low at that figure. All things considered, one would be led to believe that an offense led by as dominant a quarterback as Phillip Rivers should have no problem outscoring the Jets by more than 7. Especially when the playoffs just happen to be on the line. The Jets enter this Week 16 pairing sporting a weak 5-9 record that ranks them as the worst franchise in the AFC East. There’s no sense beating around the bush; the Jets have already been eliminated from playoff contention. In other words, the Jets don’t have much to play for this weekend other than the home crowd. New York will likely fall short this weekend, since the Chargers are playing for a playoff spot. Los Angeles also has the statistical advantage in this matchup. The Jets, led by veteran quarterback Josh McCown on offense, are averaging 20.4 points on offense and are allowing 24.4 defensively. For comparison, the Chargers are scoring 22.2 on offense and are allotting 18.2 defensively. Without a doubt, this gives Los Angeles the upper hand. In fact, all New York has going for them is home field advantage. It’s certainly nice to hear fans chant J E T S each Sunday, but it’s not going to be enough to overcome Phillip Rivers and the Los Angeles Chargers.